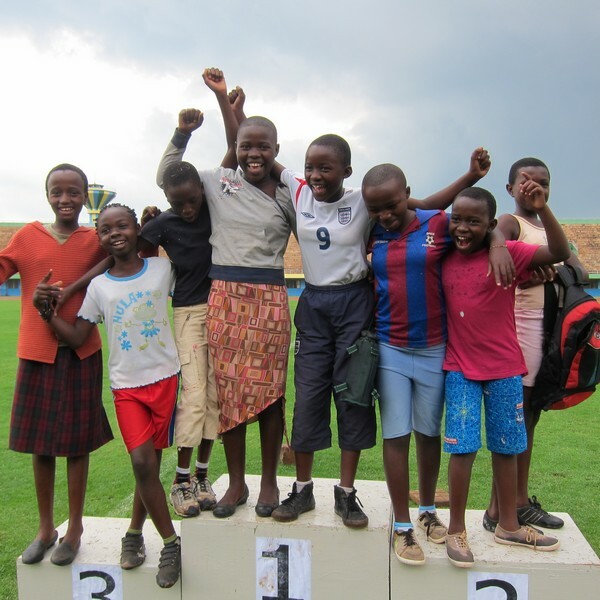 Alice who was running 10km in the VSO relay team stayed at my house the night before and made sure I got up at 6 a.m. to get to Amahoro Stadium in time for the 7a.m. kick-off. Otherwise, helping with peace may have had to wait awhile. 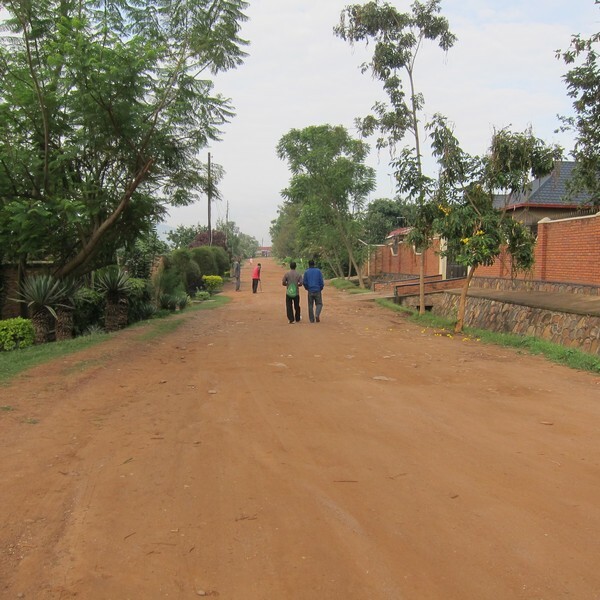 It was fascinating to be walking about the closed off streets of Kigali and to see the reaction of people on the pavement who I doubt had planned on watching a marathon and seemed more intrigued than anything else. My walking partner and I were laughed at a fair few times and encouraged to actually run. Oh the shame. It was great to see a good number of women running and doing really well. Away from the leaders (also known as ‘Kenyans’) there were a fair few girls running with no shoes (on tarmac) and no bra. This was somewhat incongruous with the big stadium setting and I hope that in time this will change. That said, other than the more professional runners and the white contingent, footwear in general was quite random. I heard the man in football boots coming from behind me a long time before he arrived! It was really inspiring to see so many people taking part and doing well in spite of their limited kit. When Katharine and I were overtaken by a chap with one leg and on crutches (he was doing the half marathon to great applause) we felt we should probably step up the pace and get on with it! It has been some time since I last made an entry. Forgive me. I have been feeling really tired for weeks and wondering if it was my age as well as my advancing anti-social tendencies (which, I feel, are intrinsically linked; wherever you are and whatever you happen to be doing) which has stopped me from joining fellow volunteers for fish brochettes, beer and japes around town. As further symptoms developed (I’ll spare you the details) I decided that praps something else was afoot (as well). So I looked up ‘medical services’ in my volunteer handbook (with blue binder, colour coding sections and everything!) and selected the ‘Belgian Doctor’ from the small list of recommended physicians. 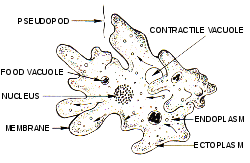 “Amoeba’s” he explained. Naturally, my thoughts drifted back to those days of darkly etched wooden benches in the biology room at Tanbridge House where the truth of life was revealed to us in odorous ways. After the copious amount of drugs were completed, I felt much better than I had in weeks. For about four days. And then I felt worse than I had the first time round. I went back to the Belgian Doctor. “Lactose Intolerance” he said. Excuse me? Pets harbouring test revealed they had gone so this, he felt, was the reason. Righto. So I have been laid out for days with the alleged lactose intolerance feeling very very sorry for self. Being ill when living alone is always rubbish; as pointed out frequently by me to friends back home, “I could die and nobody would know”. But being ill and living alone and away from friends to guilt into stopping by with an egg sandwich (with no running water, no bath, no couch) a girl can get to feeling downright miserable. Happily, I woke up this morning feeling much brighter; both physically and emotionally. This was actually at 5 a.m. as I could hear the toilet cistern filling up. Water! So I rushed about filling all the buckets and every other vessel I could find and celebrated by having a three kettle bucket bath which includes hair treatment, hair conditioning, body scrub, leg shave and foot soak! I jumped back into bed and listened to the dawn arrive whilst finishing my book. A good day already and it was barely light. My alarm goes off at 06.15 a.m.every day although I am usually awake from the dawn chorus, nay, cacophony of birdsong from around 5.30 a.m.and then the sound of the Motos beeping opportunistically for customers; their tiny engines whining at exactly the same pitch as a mosquito in the dark. 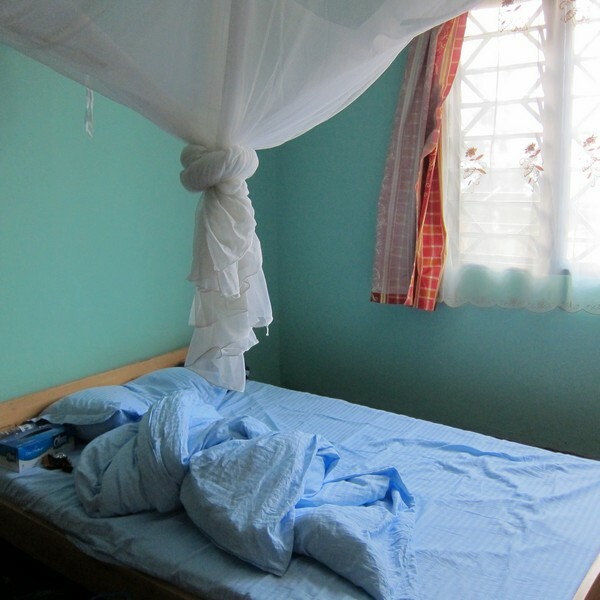 I get up and tie the bed net up to keep it pure of pestilience. Then I pad to the kitchen and boil the kettle; once for a cup of tea and a ‘shower’, or twice for a cup of tea, a shower and hair-washing; it’s amazing how far a kettle of water can go when you don’t have a water heater. 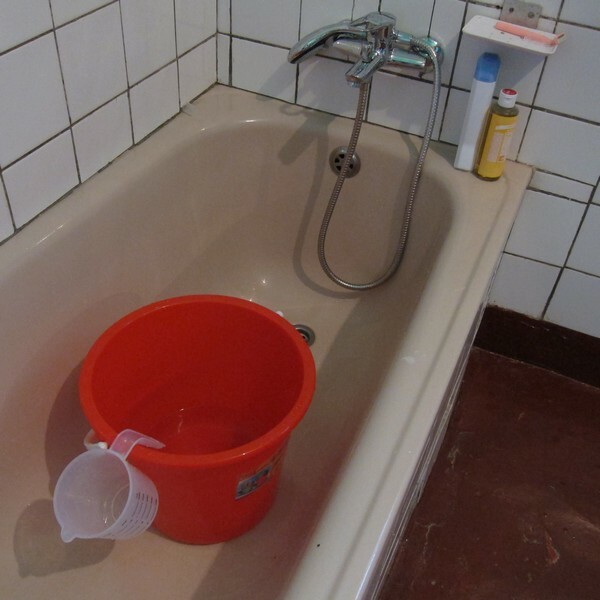 My shower is a red plastic bucket of which I have become rather fond of, given the amount of time I spend with it. I have just about perfected the two-kettle shower which often also includes a foot soak and scrub! Thank heavens I have small feet (see size of bucket). Food in general tends to be complicated. Partially as there are just two electric rings for a cooker and no storage and things go off pretty quickly. So I have opted for luxury-in-a-box – Alpen Berries. Imported (along with most things), this box costs the equivalent of around £6.60/$10 when it would cost less than half that back home. I eat it slowly…..
Then off to work. Below are some pictures to show you my commute (the alleyway I walk along next to my house and a nice lady and the road I where my job is. Altogether this takes five minutes and I arrive at 08.00 in time for prayer. At the bottom of this post is the desk I sit at and if you play the clip, you will hear singing in the background. I must have recorded this on a Tuesday as this is when the team (of three) have ‘big prayer’. It lasts for about an hour and I don’t join in (it’s all in Kinyarwanda). Although I do on every other day of the week. We sing a hymn in Kinyarwanda (of which I am only learning very slowly), then our boss explains what has been happening and what we need to focus on for the day (in english, for my benefit), and then a prayer is said invoking the will of god to support us to successfully perform the tasks just described by the manager. I am never asked to say a prayer myself and there is no pressure to attend the morning prayer. But I like to join in all the same. I find it quite a bonding and peaceful way to start the day. From this morning, things will change. I’m moving house and will be living next door! I will miss the alleyway commute and all the ‘good mornings’ or ‘bonjours’ from my fellow commuters. It’s 7.45 a.m and it is an oddly grey and cool morning. The usual thunder of Saturday traffic past my house is petering out because today is Umuganda and we are all expected (by law) to be outside joining in with our local Umudugado (small named housing sector) area works; be it cleaning in front of the house or taking part in specific works like clearing ditches. If you get in your car and go out, you will be stopped by the police and not be able to move until Umuganda is over (around 11 a.m.). I have had vague intentions of joining in since I arrived but so far have failed to identify which Umudugado I live in (and for that matter, what my address is). The night before Umuganda always seems to be extra lively in town. Last night was no exception, and I wonder if I am the only person to wake up with a sore head and a failed ambition; intentional or otherwise? So here I wait until I can go out. 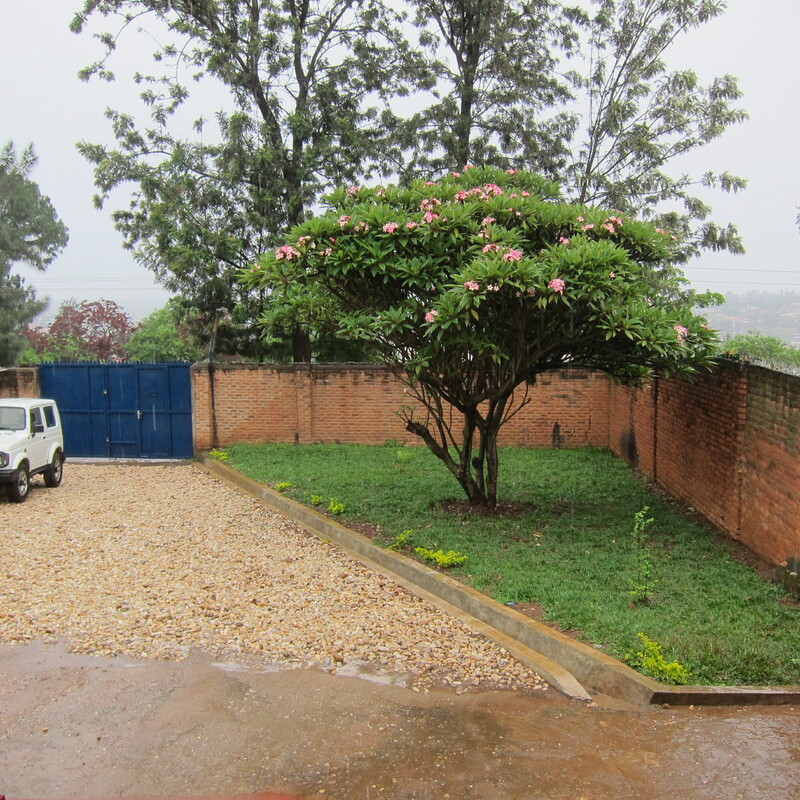 To add to the liveliness, two Grenade Attacks were also carried out in Kigali last night. They have been generally viewed as part of the run up to Genocide Memorial week which starts on Monday culminating on Saturday 7th April which will be Genocide Memorial Day across Rwanda. Eighteen years on. Where shall I be on the 7th? Driving about Akagera National Park having a fun old time. That’s where. Like so many expats, I shall be taking advantage of the extra day off on Friday and getting out of Kigali to frolic elsewhere. The exodus of westerners has started in earnest already and you cannot escape the obvious parallel this departure has on the past. As we all know, Rwanda was abandoned to its fate by westerners who lived here and was ignored by the international community until most of the killing had been completed in those 100 days and the word ‘genocide’ was finally accepted as applicable to Rwanda. The traffic sounds have now been replaced by the hubbub of voices and I can hear the odd scraping of shovels. Let’s see what next month brings; another Primus hangover or a commitment to taking part in my community of which I haven’t been bothered to find out the name of? 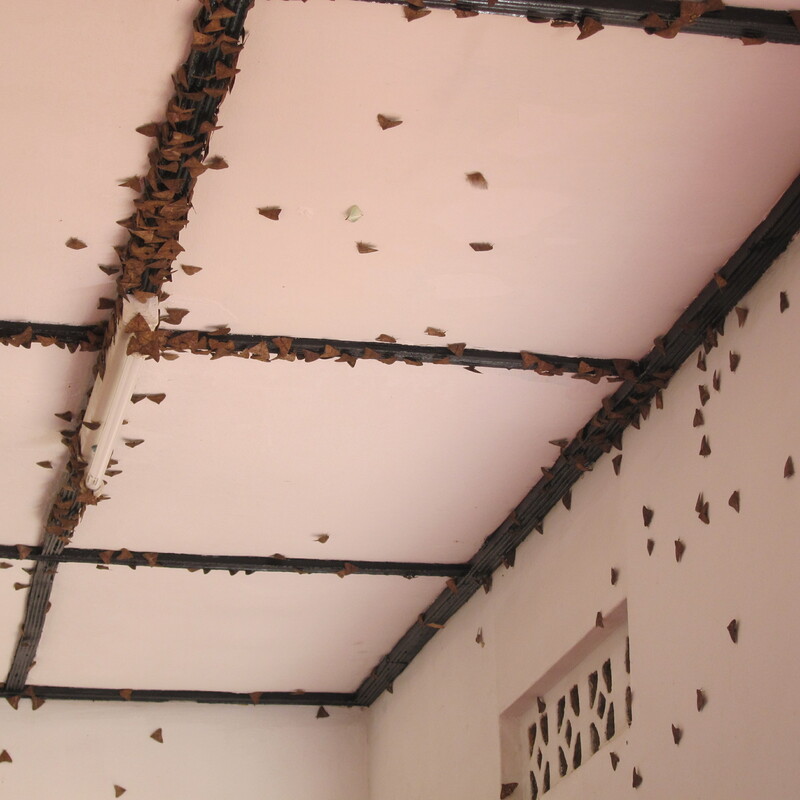 We’ve had a plague of brown moths in Kigali recently. They just appeared one morning and papered the house. At work, they lurk in the giant avocado tree and come charging out at you, scattering tiny desiccated versions of their recent selves on your dress as you hurriedly cross the yard. Perhaps they’re here as part of the weather cycle. April is when the ‘big rains’ come and we have already had some spectacular warm-ups for the event. So when I received an email from Lisa commenting on the cherry blossom coming out on the trees in Brighton and the merits of growing her petunias from seed, it made my heart pang for home. Before I knew it I had bought Elgar’s Enigma Variations on iTunes and found myself in full pine… (yes Jane, that does mean ‘Nimrod’). It is the time of year when Nicky will be making furtive trips to Wyevale, Emma and Rupert will be bounding all over the beach, and everyone will be planning trips to The Field or Cuckmere Valley and having lashings of beer at The Giant’s Rest, arguing about what pudding to have and remarking on how beautiful England is this time of year. And was that a Nightingale we heard on our walk today? Don’t get me wrong, Rwanda is an amazingly beautiful country and I am spoilt rotten by the incredible bird life here. In 30 minutes I can be in beautiful countryside with hills that go on forever. 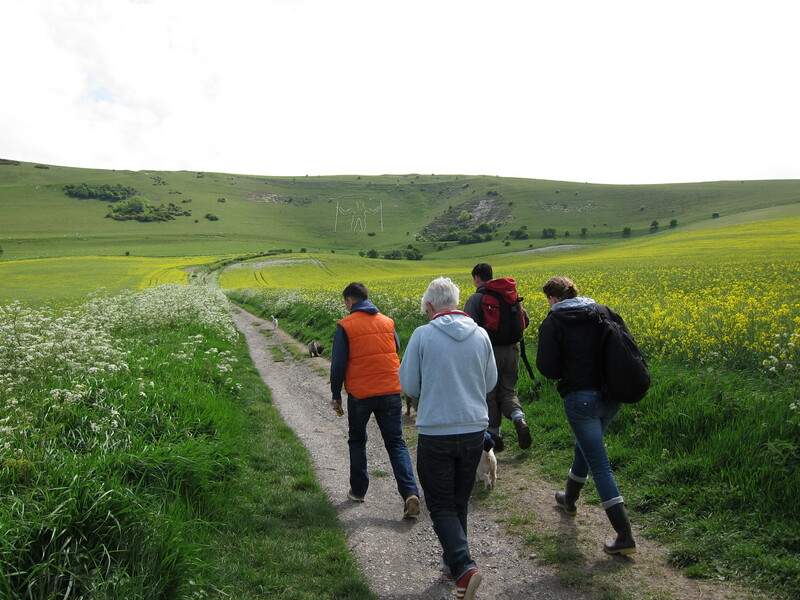 I just bloody miss sharing the spring in england with my friends. While the chaffinch sings on the orchard bough In England – now! A few weeks into being here, I have started my job and been lucky enough to get out of Kigali to Akagera National Park and to Lake Kivu; a truly beautiful country full to the brim with exotic birds, good roads and rules that everyone seems (more on this later) to obey and which certainly make it palatable for a muzungu (loosely meaning white person) like me to enjoy. 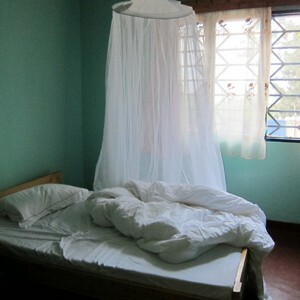 Corruption seems to be pretty low and the mosquitos even honour the flimsy net I have been issued with to cocoon myself in at night. How exotic. 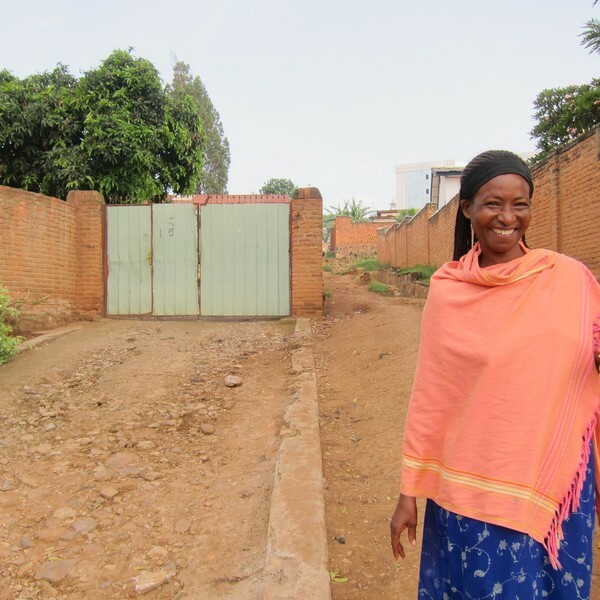 So it is with disappointment that I am met with advice from many others on the matter of how to navigate my way around Rwandan life without being “ripped off.” I find this kind of conversation anywhere between tedious and downright objectionable depending on my mood. Why on earth wouldn’t people selling things try and get the best price for them? I believe this is what is known as ‘market economy’. It is as old as the hills and we are all subject to it in one way or another… was it not Sony who recently raised the price of a Whitney Houston album on iTunes less than 24 hours after her death? Now That’s What I Call Market Economy!! It is unfortunate that as a VSO volunteer (paid a local wage) we are likely to be charged similar prices to highly paid muzungu but life is like that I guess. And who says we are not still rich in others eyes? Yes, it is important to barter; nay, it is expected. But don’t expect or demand the same price as locals. Yes this is opportunism but who said you and I are not up to the same game? Are we volunteers not here seeking opportunities of our own? If you think you are doing this for purely altruistic reasons, then think again. . There is no such thing. You will be looking for an opportunity in one way or another; just like me. I want to learn, I want to gain skills I can apply in a new and exciting job one day. I want to travel and see more of this beautiful country. I want to count the birds I see and perhaps some others activities I am not going to write about here! I know that my being here will enrich my life all the greater and more opportunities will become available to me. Can the same be said for those I meet at the market?